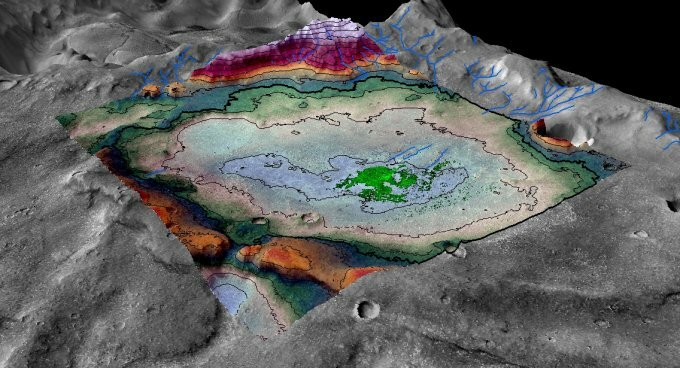 Mars turned cold and dry long ago, but LASP-led research at the University of Colorado Boulder has unveiled evidence of an ancient lake that likely represents some of the last potentially habitable surface water ever to exist on the Red Planet. The study, published Thursday in the journal Geology, examined an 18-square-mile chloride salt deposit (roughly the size of the city of Boulder) in the planet’s Meridiani region near the Mars Opportunity rover’s landing site. As seen on Earth in locations such as Utah’s Bonneville Salt Flats, large-scale salt deposits are considered to be evidence of evaporated bodies of water. Digital terrain mapping and mineralogical analysis of the features surrounding the deposit indicate that this one-time lakebed is no older than 3.6 billion years old, well after the time period when Mars is thought to have been warm enough to sustain large amounts of surface water planet-wide. Planetary scientists believe that the solar system formed approximately 4.6 billion years ago. Based on the extent and thickness of the salt, the researchers estimate that the lake was only about 8 percent as salty as the Earth’s oceans and therefore may have been hospitable to microbial life. “By salinity alone, it certainly seems as though this lake would have been habitable throughout much of its existence,” said Hynek, who is also an associate professor in the Department of Geological Sciences at CU-Boulder and director of the CU Center for Astrobiology. He noted, however, that other factors such as acidity levels were not included in the scope of the study. Mikki Osterloo and Kathryn Kierein-Young, both research associates at LASP, co-authored the study. The University of Alaska Geophysical Institute’s Remote Sensing Laboratory and the University of Arizona’s High Resolution Imaging Science Experiment (HiRISE) team provided assistance with digital terrain mapping and data processing. The NASA-Mars Data Analysis Program provided funding for the research.